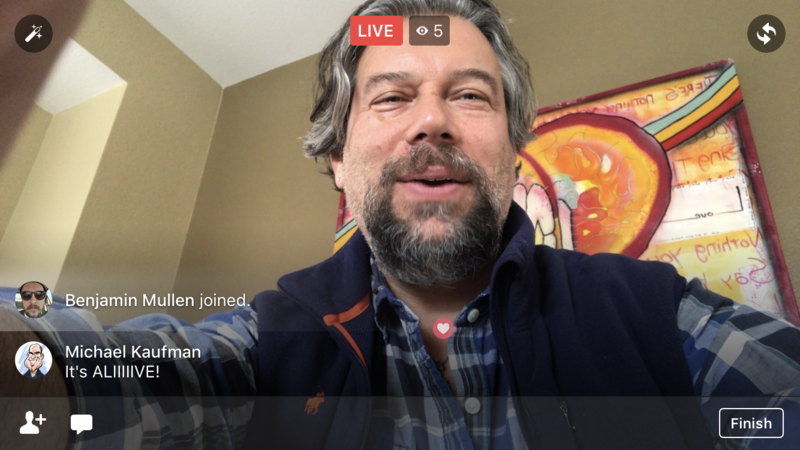 How do I get started with Facebook Live? I’d like to have a try at doing some Facebook Live. Looks fun! What’s the easy way to get started with my iPhone 6s? Or do I need a fancy camera setup? 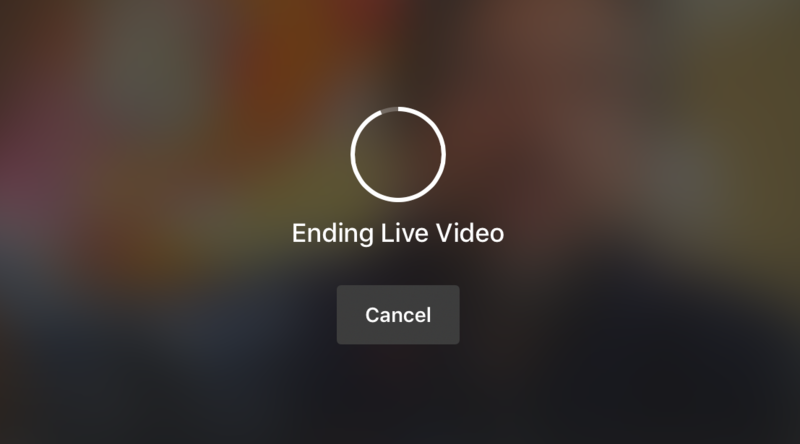 You’re good to go live with Facebook Live if you have an iPhone or Android phone, actually, though obviously a better camera and microphone will up your game as you would expect. Still, the most modern generation of devices does surprisingly well, partially because many of the people who will participate in your Live broadcast are likely watching it on a small mobile device screen anyway. Win:win! It also turns out that it’s actually more difficult to use a fancy video rig or setup to go live than to just use your smartphone or the Webcam on your computer. Facebook doesn’t want live TV, it wants live users so the bar to entry is surprisingly low. People who are more into it with their weekly live chat programs definitely use a little lavalier microphone, but quite honestly you can pick one up for under $40 if you really want to go down that route. Here are a bunch of options on Amazon: iPhone lav microphones or Android lav microphones. You can see the “Live” button on the lower left of the status update box? Tap on it! This is also a good moment to consider framing, background, lighting, etc, though you can’t quite see yourself on camera fully yet. Still, try to avoid a distracting background, make sure your primary light source is “behind” the camera so it illuminates your face rather than making you look like you’re a silhouette and try to remove background noises and distractions as best you can. Notice also that I’ve set this stream to “Public” in the top left. 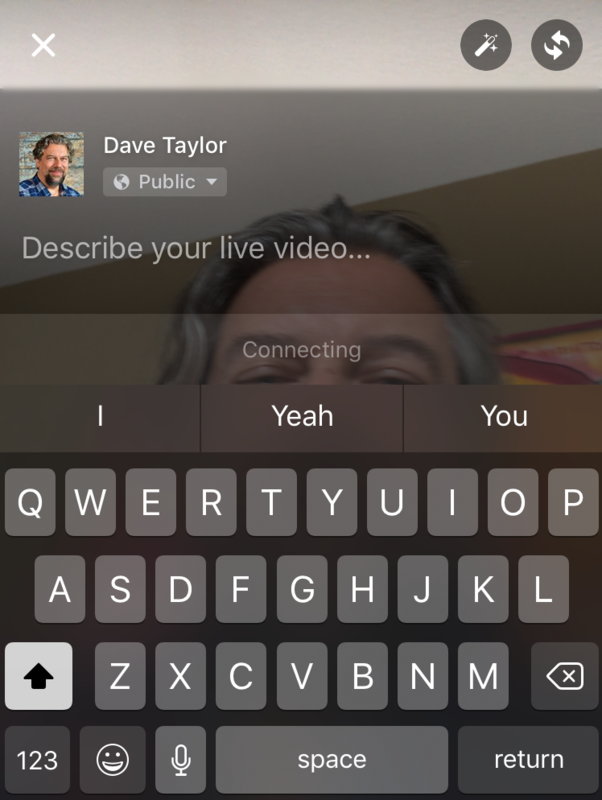 You can do a Facebook Live stream just to your friends if you want too, just tap and change that setting. 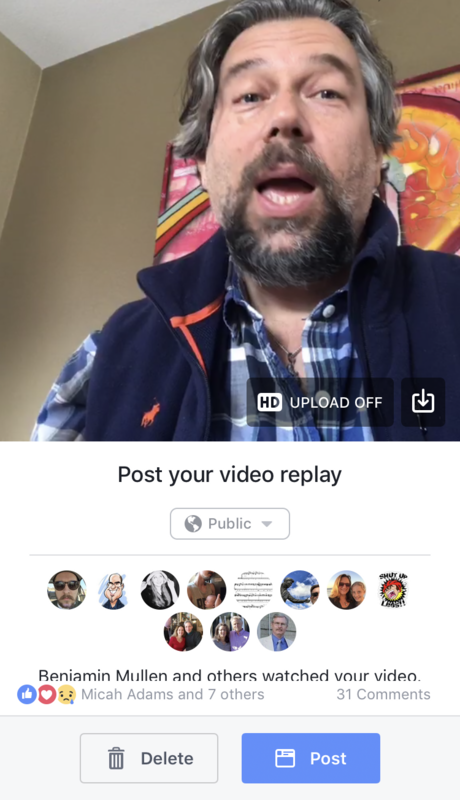 You can see that there are five people viewing this live stream (the “5” adjacent to the orange “LIVE” button at the top of the screen), that Benjamin Mullen just joined and that Michael Kaufman sent the comment “It’s ALIIIIIVE!” too. If you look more closely you’ll also see that the words in the painting are backwards. That’s because I’m using the front-facing camera on my iPhone 7, not the rear-facing camera. 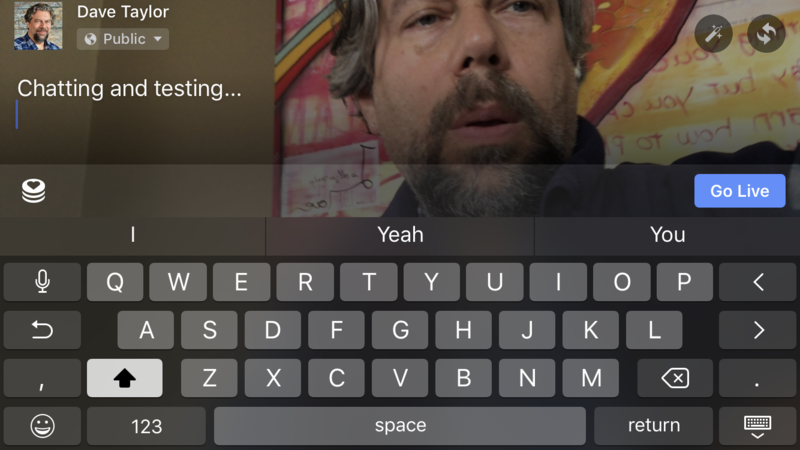 It’s a dilemma: The front-facing “selfie” camera lets you see what’s on screen, including comments as they come in, but it flips the image left/right so any text is backwards (as is your face!). The rear-facing camera is better on all smartphones, but then you’re flying blind, with no idea about comments or who’s joined or left. I keep thinking there’s a gadget that would let you get the best of both worlds, but so far haven’t figured it out. I’d suggest you try both ways and see which works better for you! Done with your live session? Okay! Tap on “Finish” on the lower right. And that’d all there is. Really quite simple. Now the hard part: being interesting while you’re on Facebook Live! While we’re talking about Facebook, I encourage you to follow Ask Dave Taylor on Facebook and check out our extensive Facebook help articles here too. Thanks for the awesome tutorial, Dave. How can I create a live video that allows users to vote with the like buttons, like they do these on Facebook pages? I don’t believe that Facebook yet has that functionality, Luca!